Browns cornerback Briean Boddy-Calhoun took preseason serious as he hit Giants receiver Odell Beckham Jr. low which resulted in a sprain ankle for the star receiver. Many expected a serious injury after watching the hit and fans are upset that such an aggressive move was done in preseason. Some questioned if it was a legal hit, others say it was a dirty play. “I don’t know, it’s just football I guess, preseason. 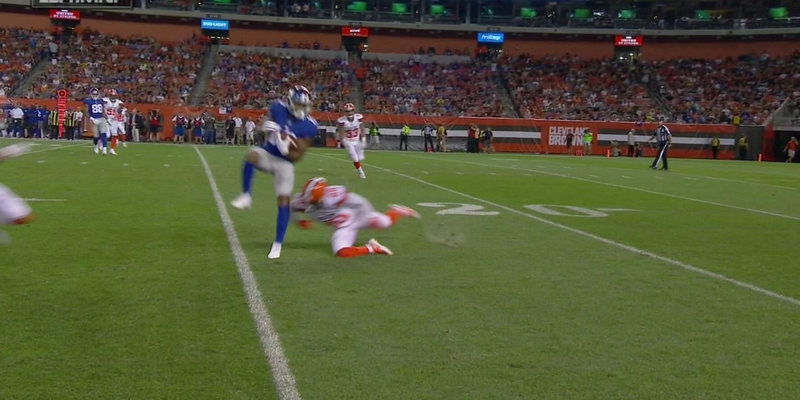 Beckham wasn’t the only receiver from the Giants that left with an injury last night. Brandon Marshall and Tavarress King were also injured in the 6-10 loss against the Browns. Terrell Owens Sympathizes For Odell Beckham Jr.